You switched to our site for Saudi Arabia. At embedded world, Rohde & Schwarz is showcasing its comprehensive oscilloscope portfolio. 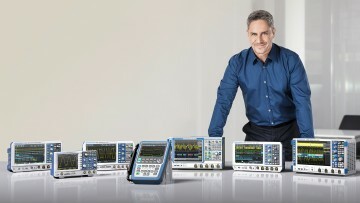 At embedded world from February 26 to 28, 2019, Rohde & Schwarz, a leading manufacturer of T&M equipment, will showcase its R&S RTP high-performance oscilloscope family, along with further highlights such as a new frequency response analysis option using Bode plots, the world's first signaling test solution for Bluetooth® LE, and a brand new power supply series. Electronics engineers are confronted with increasingly challenging requirements when designing integrated PCB architectures. Rohde & Schwarz supports them with state-of-the-art T&M equipment. At this year's embedded world in Nuremberg, the T&M expert will present selected highlights in hall 4, booth 218. The high-performance oscilloscopes of the R&S RTP family combine exceptional signal integrity with a high update rate and multiple instrument capabilities. The whisper-quiet oscilloscopes acquire up to 1 million waveforms per second and perform realtime deembedding to correct transmission losses between the signal source and the oscilloscope. This correction is usually made by filtering the acquired waveforms during postprocessing. With conventional oscilloscopes, this requires a great deal of patience on the part of the user. In contrast, with the R&S RTP, the correction can also be made using flexible filter structures directly after the A/D converters. With that approach, the R&S RTP displays the waveforms without transmission losses, i.e. as they appear at the DUT output; there is no time wasted with lengthy calculations during postprocessing. All these features combine to make the R&S RTP the oscilloscope of choice for debugging – for example when testing electronic systems or highly integrated electronic circuits with high-speed digital or wideband RF interfaces. The oscilloscope comes in three models with different bandwidths: 4 GHz, 6 GHz and 8 GHz. Another highlight is the new R&S RTx-K36 software option for the R&S RTB2000, R&S RTM3000 and R&S RTA4000 oscilloscopes. It can be used to measure the transfer function of active and passive DUTs in terms of gain and phase in the frequency range from 10 Hz to 25 MHz. The oscilloscope's integrated arbitrary waveform generator delivers the stimulus signal. Results, i.e. the gain and phase versus frequency, are plotted as Bode diagrams. The R&S RTx-K36 is especially useful for switched-mode power supplies in order to measure and tune the control loop response and the power supply rejection ratio (PSRR). The amplitude and phase margins can be read directly from the Bode plots. Rohde & Schwarz will demonstrate the world's first signaling test solution for Bluetooth® Low Energy (Bluetooth® LE, BLE), allowing manufacturers to perform RX/TX tests on their BLE wireless modules. The main challenge here is that these devices often have no port or interface to connect to a control line for testing them in direct test mode (DTM) as stipulated by the Bluetooth® LE standard. The BLE signaling test solution for the R&S CMW test platform is unique on the market. It allows the RF characteristics of a BLE device to be determined via a Bluetooth® over-the-air (OTA) connection, i.e. without the use of a control cable. The R&S CMW test platform offers three RF test modes for characterizing BLE devices: the new BLE signaling functionality, BLE direct test mode and BLE advertising mode. In addition, in direct test mode, there are 23 new test cases Rohde & Schwarz already supports with its BLE based indoor navigation solution. That makes Rohde & Schwarz the first manufacturer to launch a test solution for the new Bluetooth® 5.1 specification. For RF measurements, the specification focuses on direction finding, i.e. angle of arrival (AoA) and angle of departure (AoD). The new test cases are largely based on I/Q data, and the R&S CMW supports the I/Q tests in addition to classic RF tests. The innovative solution primarily addresses chipset manufacturers and test houses. Rohde & Schwarz has re-engineered its power meter portfolio and will present its new R&S NRX at embedded world. The power meter base unit offers up to four measurement channels and a touch GUI. The R&S NRX even supports triggered and synchronized multichannel measurements, including with a combination of terminating and directional power sensors. Users can connect a wide variety of thermal and diode based terminated power sensors to the R&S NRX ports, as well as the frequency selective R&S NRQ6 power sensor. The R&S NRQ6 is the only power sensor of its kind to deliver high-precision, high-speed measurements down to –130 dBm. It can perform band-limited power measurements, i.e. power measurements on selected transmission channels, as well as trace measurements on steep-edged pulses, and is also perfect for adjacent channel leakage ratio (ACLR) measurements, a common mobile communications application. Rohde & Schwarz will premiere its new R&S NGL200 power supply series at embedded world. Featuring high accuracy and fast load recovery times, the R&S NGL200 power supplies are perfect for challenging applications in mobile communications and the internet of things (IoT). Their two-quadrant architecture allows them to function both as a source and a sink. Their short recovery times of less than 30 µs enable them to handle fast load changes that occur for example when a device switches from sleep mode to transmit mode. The R&S NGL200 power supplies also feature minimum residual ripple and low noise. With up to 6 ½ digits resolution, they eliminate the need for an additional digital multimeter in many applications. The single-channel R&S NGL201 and the two-channel R&S NGL202 deliver up to 60 W of output power per channel. The output channels are floating, galvanically isolated and protected against overload and short circuits. The power supplies also set new standards with their capacitive touchscreens and large, high-contrast displays. Temperature-controlled fans ensure extremely quiet operation. Extensive safety functions safeguard the DUT and the power supply in the event of a fault. As the technology leader in EMC test systems, Rohde & Schwarz will also showcase its R&S ELEKTRA EMC test software. This solution provides fully automatic electromagnetic interference (EMI) and electromagnetic susceptibility (EMS) tests on products, accelerating test times and cutting costs. R&S ELEKTRA is suitable for the certification of devices for the commercial, automotive and A&D sectors. It complements the R&S ELEKTRA EMI test software, which supports interactive measurements for precompliance testing in the development phase. Automotive Ethernet will be a focal issue for Rohde & Schwarz at embedded world 2019. Automotive Ethernet, a high-speed bus system, is increasingly gaining acceptance with all leading vehicle manufacturers, e.g. for driver assistance and infotainment systems on board vehicles. Based on the R&S RTO oscilloscope, Rohde & Schwarz will present solutions for debugging and compliance testing of automotive electronic control units (ECUs) for the 100BASE-T1 and 1000BASE-T1 automotive Ethernet standards. High-speed digital is another topic that will play a key role at the Rohde & Schwarz booth. Designers of electronic circuits for automotive and industrial applications need solutions for verifying signal integrity on high-speed data lines. The R&S RTP features a realtime deembedding function (R&S RTP-K122 option) that supports users in debugging signals on USB 3.1 interfaces. Transmission losses from the test setup are corrected in realtime, which means that the R&S RTP displays the waveform as it appears at the DUT output. The R&S RTP-K91 software offers all essential tools for signal debugging on DDR3 interfaces: decoding of read and write cycles, display and analysis of eye diagrams, and automated compliance testing for the DDR3, DDR3L and LPDDR3 standards. The described options will be demonstrated on the new R&S RTP high-performance oscilloscope. These and many more highlights from the growing Rohde & Schwarz portfolio of oscilloscope and T&M equipment will be on display from February 26 to 28, 2019 at embedded world in Nuremberg, hall 4, booth 4-218. The Bluetooth® word mark and logos are registered trademarks owned by Bluetooth SIG, Inc. and any use of such marks by Rohde & Schwarz is under license.